We carry both Polyethylene and Cable Filled Polyethylene Ganglines. We stock the Polyethylene in 8 foot team sections and 9 foot wheel sections and the Cable Filled in 7 and 8 foot team sections and 9 foot wheel sections. We use 16 strand Polyethylene, 1/8" or 3/32" galvanized aircraft cable with Italian Bronze Snaps, 1/2" on the necklines and 5/8" on the tuglines. Our Cable Filled lines are double crimped, covered with shrink tubing and the Polyethylene Rope is knotted as you would if there wasn't any cable in the center for maximum safety. 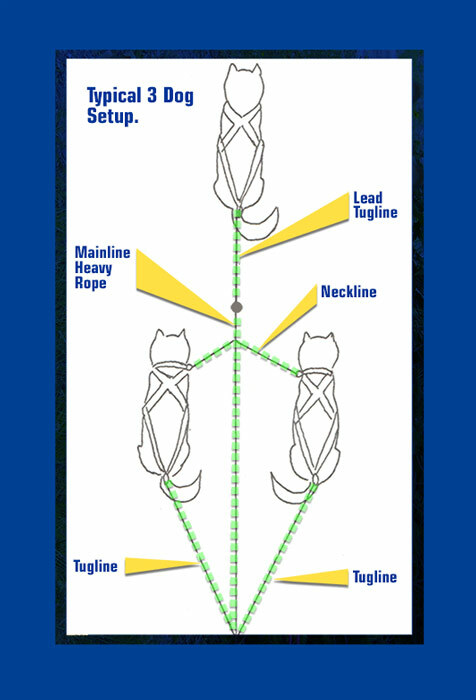 The mainline is made with 16 strand 3/8" Polyethylene and the tugs and necklines are 1/4", they are built in 2-Dog sections so that you can add or subtract sections depending on the size of the team you want to run. The shrink tubing on the Cable Filled lines is color coded. The 8 foot team sections are Red for the 3/32" and Black for the 1/8", the 7 foot team sections are Yellow for the 3/32" and Blue for the 1/8", the 9 foot wheel sections are Green for 1/8". We have a variety of colors that are noted during selection with the 3/8" mainline offered in solid or dual colors and the 1/4" tugs and necklines in solid colors. We have found over the years that knotting the polyethylene onto the snap works the best so that there isn't any side pressure on the snap which may cause the snap to break prematurely. They are both strong enough to be used with large teams. Many mushers that camp out with their dogs or run distance races opt for the cable filled polyethylene as it adds some strength and a level of safety because dogs can’t chew through the mainline releasing part of your team down the trail. Polyethylene comes in different strengths; our preference is 16 Strand as it is the strongest on the market. Whatever style of lines you choose to use precaution should be taken to inspect their integrity periodically. If the polyethylene is chewed or damaged on either style of lines it is time to replace them for the safety of your dogs. For beginner information see the image and text below the products! You have 2 or 3 dogs and you're wondering what you need for lines? If you want to run 2 dogs side by side using a sled, a light arctic shock bungee, 2 tug ropes and a leader neckline is all you need. If you want to run one dog in front of the other on a sled, a light duty arctic shock bungee, a 2-dog team section-polyethylene or cable filled polyethylene-and 1 tug rope that comes off of the front of the 2-dog section will do the job. If you want to run 3 dogs, the previous setup applies, the only change would be if you want 2 of the dogs to run in front, then you would need a 2nd tug rope and a leader neckline. The leader neckline attaches to each of the lead dog's collar ring; this keeps them both going in the same direction. SKIJOR EQUIPMENT page works great for 1 or 2 dogs. All you need for 1 dog is the towline, if you want to run 2 dogs at the same time be sure to add an extra tug rope and a leader neckline. Safety Tip: Use something to guard the rope from getting wound up in the front tire so as not to stop short. to personnel preference. 8 foot versus 7 foot team sections are again a personnel preference.